Before you get too excited this isn't the first person bloody shooter of Solder of Fortune which was released in 2000 by Activision for the PC, but the C64 version that was released in 1988 as a side scrolling action shooter originally published by Firebird Software Ltd. With game play similar to Ghosts and Goblins, you control Sarnak who has been sent to find the Zodiac Power Source, broken into six Pieces by the Krillys. Thanks to Hokuto Force this C64 release has not only been cracked with a +9 trainer, but added HS Saver, map inclusion and 3 bug fixes plus PAL/NTSC Fix. 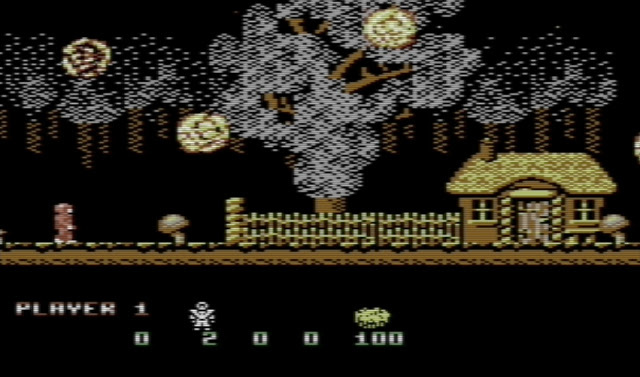 For what it's worth I have never played the original Soldier of Fortune in 1985 nor this 1988 version on the C64. But you can certainly see the Ghosts and Goblins vibe when playing it and that isn't just the insane enemy difficulty level with death at every corner, but also how the character moves and jumps. But putting the game play aside when it comes to the detail I was fascinated by the landscape colours and pixels from the tree's and houses, to the platforms and rope ladders. But there is a downside, I haven't yet been able to play the game fully to experience all the best and worst bits Solder of Fortune has to offer. But thankfully with Hokuto Force at hand, I can bang on those cheats or play without the bugs getting in the way and my evening will be complete. Map included in the package Bug 1: if Player two dies in sky level some bad gfx appears in the higher part of the screen and you can't proceed. Bug 2: if you finished the game with both players alive, you can't enter HS. Bug 3: fixed sound when starting the game and after saving scores.